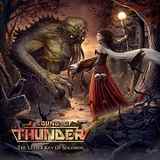 I don't have a privilege of calling members of A Sound of Thunder my personal friends, but after reviewing a pair of their excellent previous albums Out of the Darkness and Time’s Arrow I became a fan. Then came an interview with vocalist Nina Osegueda and e-mail exchange with guitarist Josh Schwartz. My decision to back their Kickstarter campaign to finance their next album The Lesser Key of Solomon was an easy one and, I guess, you can call me a member of a Legion of Thunder now. It would have been nice to be writing this review after receiving all my Kickstarter awards, primarily the album itself, with lyrics booklet, artwork, etc., but the music from The Lesser Key of Solomon is beginning to leak out on the internet, so in fear of becoming irrelevant with my opinion I have to offer it now. That, in a way, is actually a shame, since The Lesser Key of Solomon is certainly a grower, an album not meant for immediate acceptance, fast perusal and then shelving forever. With this album A Sound of Thunder certainly challenged themselves, especially in the songwriting department, but they also challenged their typical fans and listeners to broaden their horizons. Sure, Udoroth may give a false impression as to how the album is going to unfold, this hungry and heavy scorcher of a track being a perfect companion to Queen of Hell, both musically and lyrically. Yet from there, you have got to put your thinking cap on and imbibe riffs in as much as dark atmosphere, unexpected compositional twists and protracted instrumental sections. Fortune Teller is only a sign of things to come, The Boy Who Could Fly is even more moody, balladic and tender than I’ll Walk with You from Time’s Arrow, and is pretty much a prelude to the first monumental track on the album. Elijah is where A Sound of Thunder truly throws down the gauntlet and lays claim to the throne of modern day Mercyful Fate and King Diamond. Just like the latter Elijah is theatrical, but it is in no way artificial, a haunting story unfolding from dreaming to galloping, from loneliness to anguish, from delusion to revenge, with role-playing vocals by Nina just begging to listen to this song with the lyrics booklet in hand. Several more times on the album A Sound of Thunder goes for epic length and complexity. I was a little less taken by Blood from the Mummy’s Tomb (understandable Eastern motif was hit-and-miss), but was wholly submerged with House of Bones (a voodoo dive if there was one right from the beginning dark lounge piano). Fantastic Maiden plus bluesy Americana One Empty Grave with a touching melody, and dripping with slow burning heaviness Black Secrets and Master of Pain, provide a wide-ranging palette of songs where you will be forced to refocus track-to-track, but you are guaranteed not to settle and get bored. A Sound of Thunder musical performances keep growing stronger from album to album. Fortune Teller and Elijah harmonic solos by Josh are mesmerizing, drummer Chris Haren is strong and steady, and Jesse Keen has most definitely put in his best performance to date. Prodded by Kevin Guiterrez’s production bass has been given room to shine, and it did not shy away from the spotlight. Still, the face of the band, and its trump card, remains its vocalist Nina Osegueda. If you are starting a power, melodic, progressive metal band, there is absolutely no reason why you would not want Nina to be your first choice vocalist. She hits every note, with incredible power and emotion. As much as I hate numerical quotes, but have to give one, I will put in one point less for The Lesser Key of Solomon than I gave Time’s Arrow, only because I still did not have enough time spent with the album, but it is a treasure trough worthy of your time and monetary investment. Check with me in a month and I may reverse these two.